LUNCH TIME: Vultures feeding on a safe carcass at the Vulture Safe Feeding Site in Gaidatal, Rupendehi. The governments of Bangladesh, India, Pakistan and Nepal along with conservationists and scientists gathered in New Delhi last week to assess efforts to save their vulture populations from extinction. Twenty years ago, there was a widespread decline in three Gyps vulture species (oriental white-backed vulture, long-billed vulture and slender-billed vulture) across South Asia, and they were subsequently classified as Critically Endangered in the IUCN Red List. The vulture population crashed and was nearly wiped out, and the cause was the use of the veterinary steroid, diclofenac, which the birds ingested after eating carcasses of dead livestock. Since an international vulture conservation conference in Kathmandu in 2004 decided to ban the use of diclofenac, vulture populations have begun to rebound. In New Delhi last week, vultures range countries and conservationists discussed further action to save the scavenger birds and reintroduce them in the wild. Even though the production of diclofenac has been banned since 2006, there is still a large stockpile of the medicine in the market. "The most recent available information indicates that elimination of diclofenac from the vultures' food supply is incomplete, so further efforts are required to fully implement the ban," says Chris Bowden of SAVE (Saving Asia's Vultures from Extinction), a consortium of conservation organisations based in UK. Homi Khusrokhan of the Bombay Natural History Society says human diclofenac is another threat because of the large number of drug manufacturers, many of them in the informal sector. The encouraging news is that there are now vulture breeding centres in India, Pakistan and Nepal where 252 vultures are under captive breeding. But the critical question is will there be a safe environment for the new chicks when they are ready to be released in the wild? 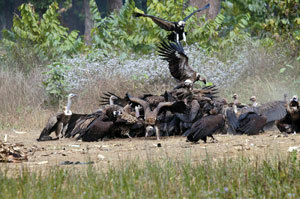 India has made significant progress in setting up vulture breeding centres in four states. Nepal has led the establishment of community managed provisional vulture safe zone (PVSZ) in 18 districts covering more than 32,657 square kilometres. Satellite tracking of vultures by Bird Conservation Nepal shows that at least 100 km radius is required for vultures to be safe and the area should be declared Vulture Safe Zones. Vultures are not charismatic species like celebrity mammals, but they perform vital ecosystem services. They are professional scavengers which add to nature's sanitation processes by consuming dead carcasses and thereby prevent the spread of disease that may be harmful to human beings. For example, the cost of managing disease in humans and domestic livestock caused by an increase in the population of feral dogs was estimated to be $ 34 billion in India alone from 1993-2006. Additional cultural cost to the Parsi community in Mumbai which relies on vulture for corpse cleaning was estimated to be $ 1.6 million during the same period. Vultures are sharply declining and local people across Nepal have already started to report the negative impacts of drop in vulture population in their villages, according to Maheshwar Dhakal, ecologist at Nepal's Department of National Parks and Wildlife Conservation. At the end of the Delhi conference, South Asian countries passed a declaration to set up trans-boundary Vulture Safe Zones. This makes sense since the birds do not recognise man-made boundaries. Hum Gurung, PhD, is CEO of Bird Conservation Nepal and a member of Saving Asia's Vultures from Extinction (SAVE). NAIROBI -- Migratory birds undertake some of the most daring journeys in the animal kingdom, often covering thousands of kilometres, and the growing fan base of these winged adventurers is now presenting economic opportunities through sustainable tourism. The United Nations Environment Programme (UNEP) highlighted the economic benefits of supporting the world's bird species by marking World Migratory Bird Day on 10 May under the slogan, 'Migratory birds and people -together through time'. Many regions are now recognising the economic potential of bird-related tourism in response to an increasing interest from the wider public. There is also a growing trend among bird tour operators to practice sustainable and socially responsible eco-tourism, while relying on local goods and services or supporting local conservation projects. Indeed, the UNEP Green Economy Report shows that global spending on all areas of eco-tourism is increasing by about six times the industry-wide rate of growth. A survey by the United States Fish & Wildlife Service puts the annual economic value generated by bird watchers (or 'birders') and other wildlife watchers at around $32 billion per year in the US alone. in Scotland, the Royal Society for the Protection of Birds found that tourists spent up to $12 million in 2011 to see White-tailed Eagles on the Isle of Mull alone. Birding plays a significant and growing part in the tourism industry, and creates direct and indirect economic benefits for many countries and communities, and wildlife watching is increasingly a factor in tourists' holiday choices today," said Elizabeth Maruma Mrema of the Convention on the Conservation of Migratory Species of Wild Animals (CMS). The African-Eurasian Migratory Waterbird Agreement (AEWA) is monitored by BirdLife International, Wetlands International and the Secretariat of the Partnership for the East Asian Australasian Flyway (EAAFP). "The scale of the problems and the actions required to reverse the fortunes of our migrant birds are daunting, but international collaboration offers the best chance of achieving effective conservation for these species," said BirdLife's CEO, Marco Lambertini. Conserving migratory birds is highly challenging because their annual migration often spans several countries, each governed by its own jurisdiction and national conservation strategies. 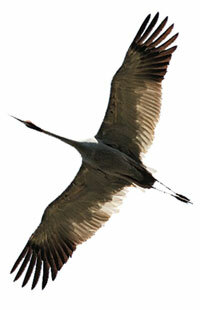 Which is why AEWA tries to protect migratory birds for whom national boundaries don't exist.